For nearly seventy years, this South Jersey landmark was a prominent gateway to Medford Lakes, a unique pinelands community of log cabins situated among serene cedar lakes. The Log Cabin Lodge, renamed The Settler's Inn in 1976, was modeled after a large log cabin with impressive stone fireplaces in Yellowstone Park. The Lodge was considered to be one of the largest full-log constructed buildings in the United States. Inside, The Settler's Inn had an open atrium design which displayed two magnificent stone fireplaces that were constructed of several hundred tons of stone and towered to a height of seventy-five feet. The grand structure was a constant reminder of our American heritage, our link to our environment and our rustic pioneer roots. The devastating fire which claimed the historic building on January 10, 1998, has had a dramatic impact on the residents of the immediate area and surrounding communities. It was almost as if the structure had a spirit of its own which had silently woven itself into the fabric of people's lives. To many who mourned its loss, it was like losing a friend. Others just wished they had appreciated it more when it was here. To Sandy, it was a reminder to savor the moment and to try harder to appreciate the little things in life we all so often take for granted. Hundreds of couples who held their wedding receptions at The Inn, find it sad that the physical presence of that special place is now gone. The special occasions celebrated, the food and drink savored, the relationships cultivated and functions attended are all memories now. The Settler's Inn is no more, but will continue to live on in the hearts and minds of all the people who were touched by its presence. 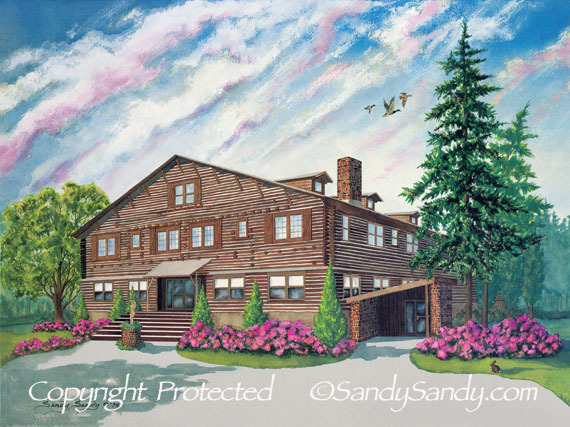 Sandy Sandy has preserved this great memory through her painting, Settler's Log Cabin Lodge. "I used artistic license and painted this portrait the way I think people would like to remember this impressive icon. It's a springtime scene, signifying the renewal and resurrection of a structure that was much more than just a building. I feel people deserve more than a memory. I hope they can find joy in the ownership and appreciation of one of my limited edition prints. I know it can never fill he void, however I've tried to produce a piece befitting its grandeur.